I want to tell you about a project that the Gateway Division has undertaken in each of the last years. We call the project the Gateway Central Project Layout. It is the sort of project that just about any division or group of NMRA members could duplicate. Gateway Central IV, like its predecessors, is a 4’x8′ beginner layout constructed by division members. Each of the layouts has been used to try out a variety of construction techniques for support, track design, scenery and structures. The project involves a large number of members in many different activities and provides a tool which is used for 3 or 4 clinics at the division’s monthly meetings to demonstrate the techniques used. Why Build a Gateway Central? There are a number of good reasons to take on a project like this one. First, it gives members who don’t have a personal layout the opportunity to work on construction of an operating layout. This increases their involvement with the organization and gives them an opportunity to learn techniques which will help when they get around to building their own home layout. The work I have done on these layouts will help me to avoid some potential pitfalls when the eL & eL finally starts construction. Construction of the layout itself is not the only way our members get involved. Many members, who can’t arrange to attend a worksession volunteer to assemble structure kits or even scratchbuild a structure which will be used on the layout. These structures may also become the focus of a division clinic on basic assembly, kitbashing or detail finishing. Another reason for a project like this is the increased contact among members. Monthly meetings are great but they do have a time limit and sometimes there just isn’t a chance to socialize and talk railroading. Working for 8 or 10 hours on the project layout lets us get to know one another better and, in the process, encourages a stronger feeling of membership in the division, region, and national organization. We become friends as well as members. These work sessions also let members share their special skills and help the rest to learn those skills in a “hands-on” setting. The Gateway Central IV is also used to help inform the public about the hobby and to encourage membership in the NMRA at all levels. Each of our project layouts has been displayed in many different settings. The Museum of Transportation has an annual free admission family weekend where we display the layout. It has gone or will go to train shows sponsored by local clubs. One of the layouts spent several weeks on display in an automobile dealership’s showroom. Basically, we will take Gateway Central anywhere that there is likely to be a group of people we can talk to about the hobby. Whenever the layout is on display we also do mini-clinics. The topics focus on basics like laying track, doing basic scenery, tuning rolling stock, building trees, etc. The layout itself shows what the finished product looks like using the techniques in the basic clinics. As a result people are more inclined to ask us questions about all aspects of the hobby and that in turn gives us an even better chance to encourage NMRA membership as a real benefit regardless of the level of expertise. The first step is to find a chairman. The project chairman’s responsibilities include scheduling work sessions, obtaining materials, and getting members to contribute materials, equipment, and time to complete the layout. This job might be a great way for somebody to make real progress towards getting the points needed for AP Volunteer. A typical work session will be all day (and often into the evening) and will have 4 to 8 members working on construction. We fund each layout from the division treasury, coupled with donations from members, local hobby shops, hobby manufacturers, and finally, by raffling the layout. We sell chances to win the layout for $1 per chance. The winner gets a fully finished layout with a locomotive, rolling stock, structures, and a power pack and we deliver the layout to the winners home if he/she lives within 50 miles of St. Louis. I wish everyone who reads this article could have seen how high the winner of Gateway Central III jumped when his name was called last October at the Museum of Transportation. He purchased tickets to win the layout for his son (2 or 3 years old) but I suspect that Dad will run the wheels off that layout before his son ever gets the chance. Raffle chances have paid the full cost of each Gateway Central and produced some profit to add to the division treasury. Gateway Central IV was on display at the St. Louis GATS show on January 18 and 19 and was always surrounded by a big crowd. We answered thousands of questions, conducted four clinics each day, sold a lot of chances, and on Monday, January 20, 1997, at our regular division meeting we had the largest number of guests that I can remember attending. One of those guests became a member at the meeting and we hope to convert most of the others. I have worked on some aspect of all four of the layouts and plan to work on the next one as well. Even though Gateway Central IV won’t be given away until September 7 at our annual fall meet, we are already discussing ideas for the next one. Right now one proposal for Gateway Central V is to build it as two 4’x6′ sections. 4’x8′ layouts present some transportation problems. We have only one or two members with vehicles big enough to hold the layout in an enclosed space and moving it in an open pickup truck tends to blow the trees off. Two sections also means a layout with more operating potential. If you are looking for a way to involve your members, promote the hobby, and gain new members then build a railroad. Rick Lake models the free-lanced transition-era HO scale El Dorado and El Reno Railroad, running from Lillie, Louisiana, through Arkansas to El Reno, Oklahoma. After retiring from teaching at St. Louis Community College–Florissant Valley, Rick worked part-time as engineer and dispatcher on the St. Louis Zoo Railroad. His father, R. E. Lake, Jr., worked for the Rock Island Railroad, and his family lived in 8 towns in 7 states in the system, including El Dorado, Arkansas, and El Reno, Oklahoma. During high school and college, Rick worked part-time as clerk, road crew, switchman, and fireman, which explains the strong Rock Island influence on the El & El. While browsing the internet, I came across your: Gateway Central IV “Ozark River Valley” Gateway Division 1997 Project Railroad. 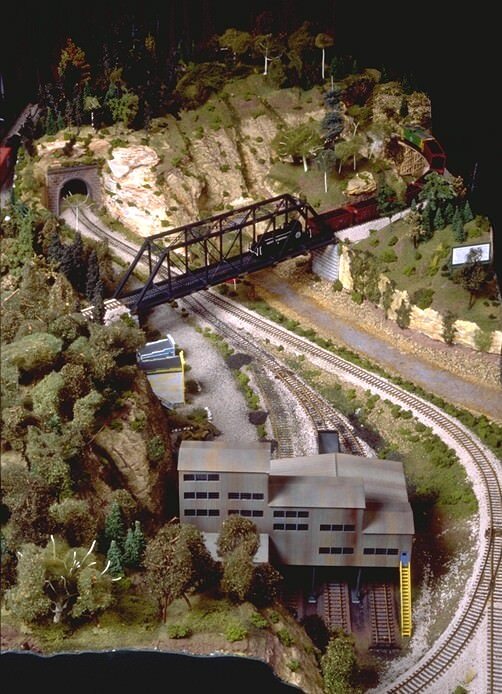 The photo (by Richard Schumacher) of the Coal Mine and beautiful “S” curve scene – suggests to me – that with a slight bit of ‘straightening’ of the track -and also of the road or stream (to the right of the track)-, this could be a very nice subject for creating a double-length 2′ X 4′ module theme! Get new articles & announcements.